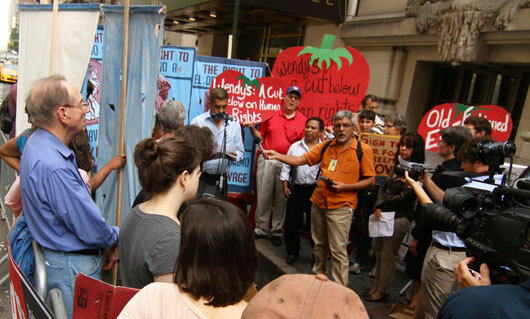 You can’t be the last holdout in the fast-food industry from the internationally-recognized Fair Food Program — every one of your major competitors having long since signed-on — and expect that a mature, widely-respected movement like the Campaign for Fair Food isn’t going to make a strong showing at your annual shareholder meeting. A multi-billion dollar company like Wendy’s can’t afford to miscalculate like that, especially not in front of its shareholders. Please. That kind of total abdication of responsibility failed miserably in the early 1990’s at the birth of the anti-sweatshop movement, it has never worked in the 13-year history of the Campaign for Fair Food, and as the horrific news out of Bangladesh has once again demonstrated over the past several months, it has absolutely zero chance of working today. Unfortunately, Bob Bertini couldn’t do any better than that because Wendy’s doesn’t do any better than that. At least he was honest about it. Wendy’s CEO Emil Brolick hardly did any better than Mr. Bertini. His performance inside the meeting in response to questions from representatives of the CIW and ally organizations was, to say the least, less than forthright. First, he tried to outright ignore a question by the CIW’s Gerardo Reyes. 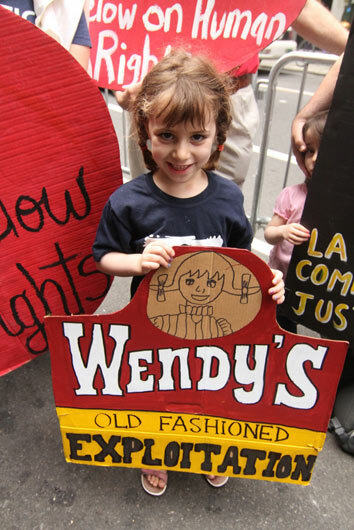 Then, when pressed by the Reverend Noelle Damico of the Presbyterian Church (U.S.A.), he tried to claim that Wendy’s is participating in the Fair Food Program because its suppliers are required to sign Fair Food agreements. (Of course, that’s not how the Program works. The suppliers are doing their part in the Fair Food Program, because of the efforts of all of Wendy’s competitors. But it is the responsibility of the buyers like Wendy’s to use their purchasing decisions to enforce the changes underway, and to pay the Fair Food Premium to support those changes, and Wendy’s is not doing any of that.) Finally, when that didn’t work, Mr. Brolick tried to confuse the situation by claiming that Wendy’s already pays a premium on its Florida tomato purchases… just not the Fair Food premium, and not one that has anything whatsoever to do with farmworkers or social responsibility. So that was the back and forth inside the shareholders’ meeting. 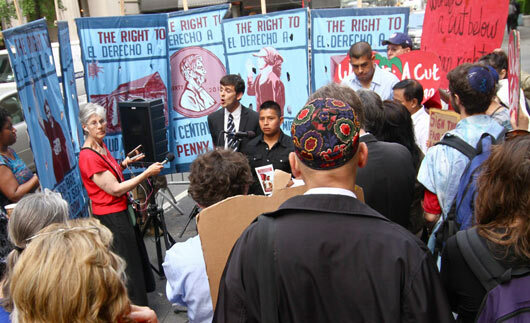 But before the CIW and its allies headed inside for their wholly unsatisfying dialogue with Mr. Brolick, they held a lively press conference outside the hotel, with participation by every sector of the Campaign for Fair Food. The press conference drew seven news outlets and was covered widely in the national press (the AP story alone went out to hundreds of papers across the country, from the Wall St. Journal to the Gadsden Times of Alabama). Coverage of the press conference was extensive, running the gamut from Democracy Now to the fast-food industry journal, the Nation’s Restaurant News. Check back soon for a complete media round-up from the event, and for more analysis from the first major battle of the Wendy’s campaign. This story’s just getting started. It may be a long, hot summer for the hamburger giant.